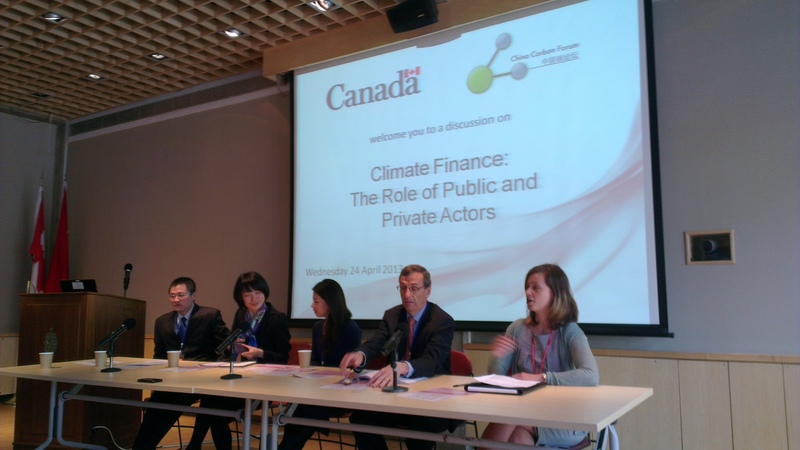 From Left: Mr. Jun Ying (Bloomberg New Energy Finance), Dr. Wang Yao, (Central University of Finance & Economics), Ms. Weiwei Kou (Carbon Trading Capital) Mr. Scott Vaughan (IISD), and Ms. Stephanie Jensen-Cormier, (China Carbon Forum & Canadian Embassy). At the macro level, the world faces at the same time, three huge challenges: global financial reform, a fundamental restructuring of energy markets, and climate change. These are all happening at exactly the same time, the challenge is, can we find a way to synchronize these challenges. Climate finance must be designed for up-scaling and leverage to ensure adequate money flows for climate action. More private and public interaction is seen as a critical development, but that limited public funds were seen as essential in unlocking climate finance from the private sector, especially to start with. This requires an understanding of the structural rigidities that stop investments in climate finance. China has made good progress in the area of green finance and carbon market policies, but still faces a number of key challenges, including: a lack of institutional arrangements and policy frameworks; a lack of flexible financial mechanisms; and, developing a climate finance target. The underlying financial market reforms were seen by all as the key to unlocking finance for climate action. As China’s financial system is still forming, it is seen to have a unique opportunity to integrate climate finance into its other financial reforms over the next 10-15 years. The following is an edited synthesis of discussion that took place over 1 hour with panellists and an open Q&A with participants. As per convention, individual’s comments are not attributed. • Bloomberg New Energy Finance estimated that, total global investment in clean energy in 2012 was 269 billion US dollars, down 11% from 2011, and that if global carbon emissions stopped growing immediately; clean energy investment alone would need to be at least $500 billion by 2020. • The assumption that private finance will be more attracted to mitigation strategies and adaptation will be left to the public sector is probably misleading. Research shows that between now and 2030 17% of the world’s total infrastructure investments per year is needed to build in resilience for climate shocks (adaptation) given the projected increase in temperature. • Are the climate finance mechanisms we have today sufficient? Fast-track commitments from Copenhagen set a 100 billion dollar target. However current annual expenditures in total climate investments are 360 billion dollars per year and the demand continues to grow. • Among the big challenges for climate finance is innovation, particularly around Public Private Partnerships (PPPs). This is because climate friendly actions always have incremental costs, which affect investors’ decision-making. If public finance could afford the incremental costs (take on higher risk) it would leverage more private funds. • Although the proportion of public funds is limited, the public funds play a crucial leading role in climate finance. One noted successful case was the Danish government’s establishment of a climate investment fund where every euro of government investment attracts an estimated of 7 or 8 euros in comparable investment. • The importance of public policy coherence was also noted. Governments should avoid developing sets of policies that on one hand drive incentives to reduce emissions, and on the other hand provide incentives (subsidies) for fossil fuel sectors to produce emissions. • China has done a lot on climate finance, but still faces a number of critical challenges to enable effective implementation. Currently there is a lack of incentives for investing in climate finance at all levels and no unified regulatory bodies. Second, there is a lack of flexible financial mechanisms, including inefficient public funding, while the private sector is largely taking a “wait and see” attitude. Financial instruments are seen to be insufficient and investment is unbalanced toward mitigation, while the financial channels are narrow. It was therefore suggested that at the national regulatory level, China should include climate finance as part of its climate change law. • For China’s pilot carbon markets, it was seen as crucial for the government to think about how to promote the entrance of financial institutions into the market. One of the barriers to this is that the pilot schemes will only permit allowance trading, not trading credits which means the market will lack liquidity. Further, enterprises that have allowances might hold onto them, and not sell them. • Some innovative suggestions for climate finance include: the development of project bonds, or peer to peer financing. In Europe this year it’s expected that we will see larger, emerging markets calls for project bonds, especially for institutional financial investors, like pension funds. If we see the issuing of project bonds in Europe, it could be a good match for pension funds to put on their assets list. In the US, asset-backed securities or solar real estate trusts are starting to be used. • The main climate finance resources are international public funds, international private funds, and domestic public funds, also carbon market funds, and other domestic private funds. These could be combined to leverage more private fund flows in green investment. • Policy could play the most important role for addressing climate change, especially in China. This is not only because policy can promote the government to use public finance, but also facilitate green investment from private funds. It was suggested that the Chinese government needs to mobilize international and public resources to optimize policies. 1) Focus on the traditional financial regulation policy – the banks. 2) Incentivize and mobilize the private sector for green financing.